Lincoln is a looker, that’s for sure. Standing strong with a sturdy oak veneer, this is a lasting statement piece set to take your bedroom to the next level. Pair with other items from the range for a complete look. Stylish? Tick. Functional? Tick. The oak veneer is contrasted with a chic grey surround. There’s a single shelf and one chic drawer, complete with a simple push-catch opening, for storing all your sweet-dream essentials. 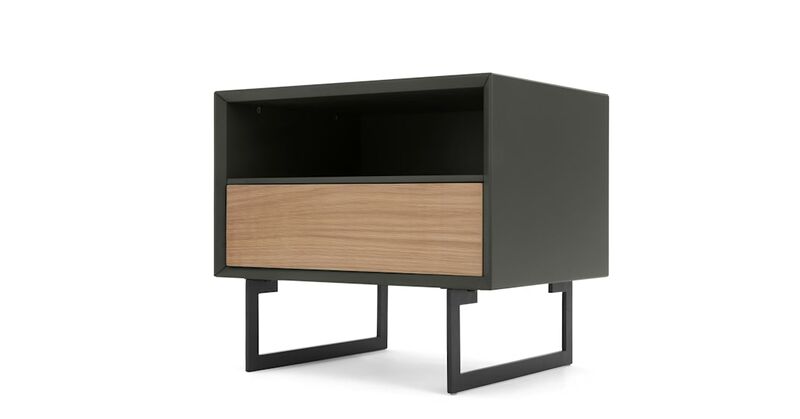 Ultra-sleek and design-led, Lincoln stands proud on two slim powder coated black metal frame legs. The contrasting boxy body appears to float above them. Clever stuff.